I've been on a whirlwind NYC trip (sounds scandalous, I know). 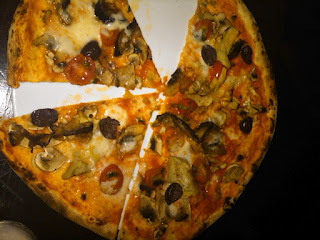 Last night (Friday), I went to Gnocco with a friend for her birthday. The restaurant is way downtown and truly a hidden gem. Not only was the food outstanding and homemade, but it was also extremely affordable. The restaurant is on E10th between A and B and when we walked it, it looked like we were stopping into a pizza joint. Now NYC has great pizza, so I would have been ok with that but I knew better! We were seated in their garden area. The best way to describe it is like a baseball stadium with a sky dome. It was a brick area with some plants, tables and a tent-like seal overhead. The meal started with some italian bread and outstanding olive oil and balsamic poured for us. Since we could not decide individually on pizza or pasta, we got two dishes and shared. Great choice! 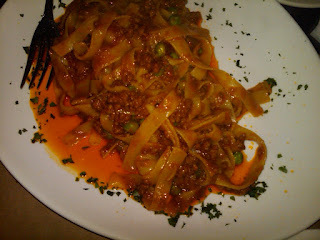 The pasta dish was tagliotelli with homemade ragu and peas. The pasta was fresh and sturdy and the sauce was perfect. As my friend put it "there is way more meat than tomatoes." I could also tell by the consistency of the peas that they too were fresh. See the photo we took below on a smart phone. The pizza was outstanding. We got a vegetable one. The crust was as thin as possible without breaking. The pizza was loaded with artichokes, mushrooms, fresh tomatoes, cheese, sauce, eggplant and onions. It was perfectly cooked. The crust was tasty with a hint of salt. As I'm writing about it right now, I'm wishing I took the leftover slice home and had it for breakfast. Also, the service was outstanding. Next time, I go, I plan to save room for one of their homemade desserts.